2 years ago I installed trim tabs on my boat. I used Interlux Interprotect 2000E as the primer mostly as per labelled instructions (see below). That fall, when I pulled the boat, the paint and primer came off in sheets. I called Interlux and was told I shouldn't have prepped with acetone before applying the primer and to use their proprietary cleaner (2316N). So, I took off the tabs, disc sanded them down with 40 grit to bare metal, cleaned with the 2316N and applied the primer absolutely per the labelled instructions. Last fall, it again came off in sheets. Any other suggestions for a metal primer below the waterline? What are you applying? Antifouling? If so, I simply coat mine with the antifouling paint intended for sterndrives and outboards ( Pettit's is Alumagard, I believe). Adhesion isn't perfect, but mostly stays on and provides pretty good protection. ( Like some slime and maybe two or three barnacles per tab by end of year) My season is April to November. 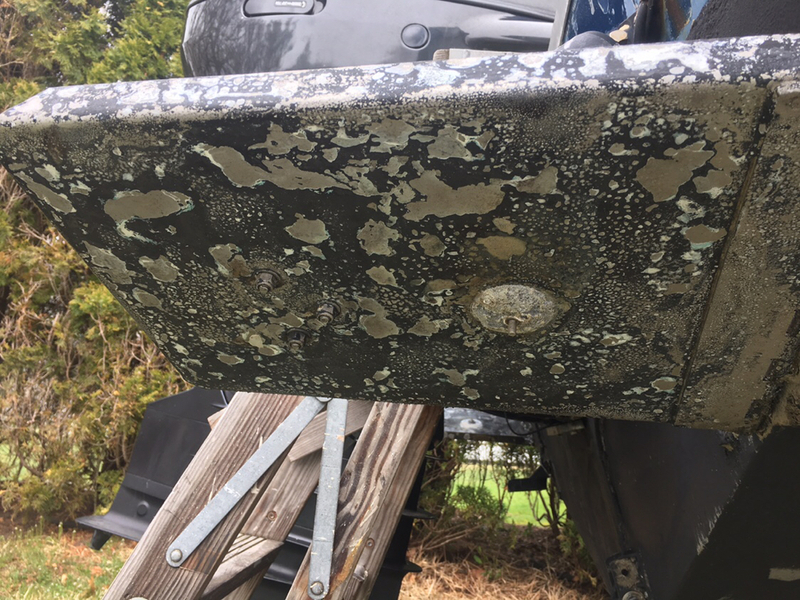 In the spring I give them a scrape to get any flaking stuff off, sand the spot where the anodes get installed to bright metal and mask it off, and just overcoat. If you are painting for aesthetics, you'll need to use an" etcher", then several coats of an epoxy primer, then your topcoat of choice. You can certainly go that route for trim tab anti-fouling, but I, personally, don't. I think this is what Kevin is suggesting. Yes, I applied an interlux antifouling paint over the 2000e metal primer. Your suggestion sounds good. Any thoughts on whether I need to strip these down to bare metal (again!) to get all the old 2000e off, or can I just give them a quick once over with a wire brush/sandpaper and then cover with one of the metal antifouling products? The tabs are steel, so I was looking at the Petit Prop-Coat Barnacle Barrier. I usually leave the boat in from May till October. Yeah, I'd use some 150 sand paper or a green 3m pad. Nothing fancy. Just scratch the 2001, wipe it clean of dust. Then put on two or three light coats of the antifoul. Three if using the aerosol or two if applying by brush. The reviews are good on propcoat; one of my guys used it on nibral props and likes it; I have not personally used it. How about using Prop Speed. it was pretty much designed for these applications. Pricey and a little finicky to apply, but once on it works great. According to a tech rep from an adhesive bonded fastener company, acetone is often recycled and contains contaminants that can cause bond failures. Never trust the stuff as a final cleaner. Alcohol is usually cleaner. I have tried cleaning surface side by side with acetone and isopropyl alcohol and the adhesion was dramatically different. I can't say that a different brand or batch of acetone would have given the same result. There could be something else going on with the boat. Anodes, silicone grease, dissimilar metals? There is a water break test that will tell you if there is contamination on a freshly cleaned surface. Clean the surface, spray on some distilled water. the water should spread out evenly, not bead up. If it beads up, there is something like an oil still there. According to a tech rep from an adhesive bonded fastener company, acetone is often recycled and contains contaminants that can cause bond failures. Never trust the stuff as a final cleaner. I have read this somewhere before and seem to remember Klean Strip supposedly being a good brand, which is what I use. That being said, the second go round I used the Interlux proprietary solvent with the same outcome. The clues are coming in real slow on this one! Doesn't really make it easy does it? I don't suppose a photo would be possible? I'm interested now because I have stainless rudders on my boat and no luck so far getting anything to stick to them. I did see a suggestion on another thread recently to use wet and dry sandpaper, wetted with your favourite epoxy primer. I think the problem with stainless is that it forms a protective oxide coat on its surface almost immediately, so you can sand rough or sand smooth, but nothing will stick to it. Unless you happen to get a bit on the kitchen sink at home. That will never come off. So wet and dry paper gets the epoxy straight on to the abraded stainless before it has a chance to oxidise. Haven't tried it but it sounds like a good theory. Why prime or paint it/them at all? Stainless is hinky about two things, being painted and being underwater. You are two for two! If you don't paint them, theyll be alive with barnacles, slime and grass. Here's one of mine today. This after a season in the water and then being pressure washed in the fall. No primer. Even the pressure washer ( white nozzle) doesnt blow all paint off them.